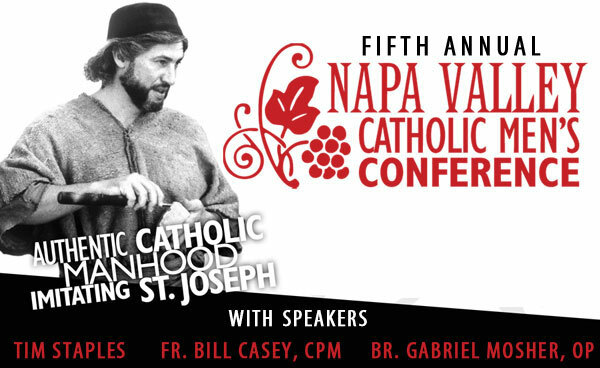 The Fifth Annual Napa Valley Catholic Men’s Conference. We all know the challenges of being a Catholic man in the modern world—we need support from our brothers in faith. On Saturday, April 17, we convened at St. Apollinaris Church, Napa, California. Featured talks were by some of today’s top Catholic leaders, you won’t want to miss out on these inspiratrional and energizing talks. Tim Staples was raised a Southern Baptist. During his tour in the Marines he began to study Catholicism from historical sources. Determined to prove Catholicism wrong, Tim studied his way to the last place he thought he would ever end up . . . the Catholic Church. Tim is now married with a family and has been working in Catholic apologetics and evangelization ever since, heard often on Catholic radio. Fr. Bill Casey, CPM, a native of Philadelphia and a graduate of Temple University, served as an officer in the U.S. Army. After leaving the Army he entered the Fathers of Mercy and was ordained a priest in 1991. In 1997, Fr. Casey was elected the Superior General of the Congregation. Father Casey is a renowned speaker at conferences nationwide and a frequent guest on EWTN. Br. Gabriel Mosher, OP, is a Dominican of the Province of the Most Holy Name of Jesus. He received his BA in Philosophy from Holy Apostles Seminary. Br. Gabriel has worked in parish youth ministry and taught courses on Catholic education.